These 1.5 oz nylon ripstop parachutes feature flame-retardant rip-stop nylon that meets California specifications & have an ultra violet (UV) coating to make them last longer in the sun, our Play Parachutes all have Handles making it easier for everyone to hold on to. Reinforced mesh center that allows ample air flow and prevents balls from rolling through the middle. Machine washable. Color: Multicolored: red, blue, yellow and green panels, and White. 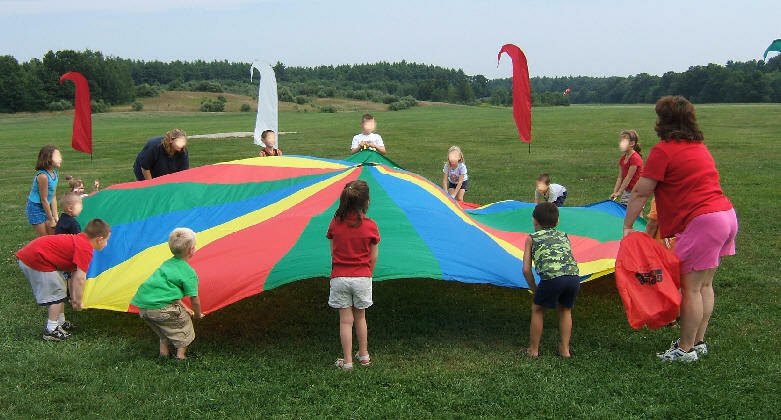 These play parachutes are also used for outdoor shading, deck awnings, tents, to lower ceilings, special occasions for outdoor activities, to name a few. Nylon ripstop play parachutes are perfect for pre-schools, elementary schools, dance groups and children's clubs! 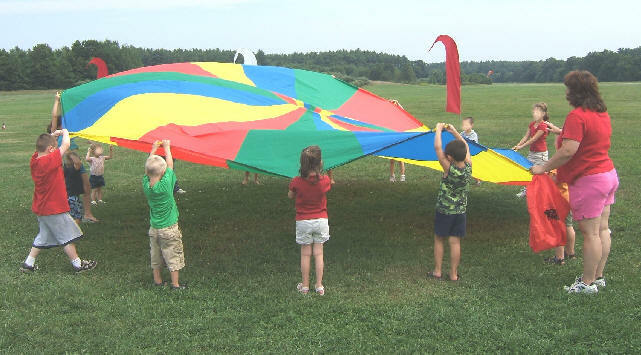 These parachutes are great for groups of children. Upper-body strengthening and cooperative activity for all ages. Younger children enjoy rhythmical and musical activities; older ones find fun and challenge in tossing a ball and moving as a team to catch it. 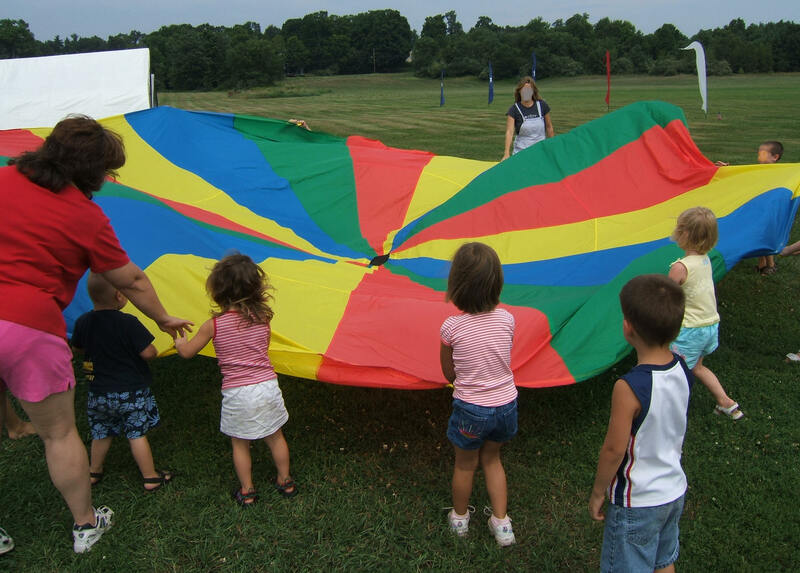 Rainbow & white colored parachute has as many possibilities as your child can think of! Now you can have your own parachute just like those at school! 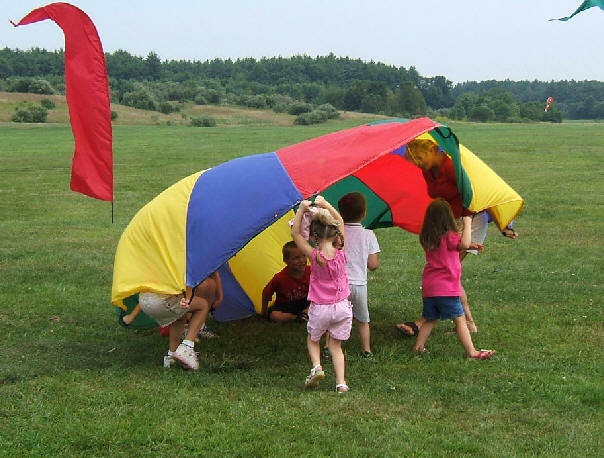 With handles around the parachute's circumference, many children can play depending on the size.. The idea is...altogether now...to lift it up and run under before it collapses on everyone! Held up and at an angle, it's a giant, wind-catching sail. Or toss balls on top, then shake it up and down. And, of course, it's a great backyard or beach ground cover! Durable, ripstop denier nylon, machine washable. Different diameters with mesh center. Wonderful for birthday parties, especially with music playing! Active play like this gives children a chance to develop big motor skills and a sense of their own physical being. 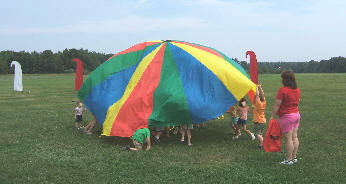 See bottom of page for suggested parachute games!